Das Konzept der Substanz im Steuerrecht. Dissertation (english) von Robert Leukefeld, Verlag Dr. Kovač 2018, 464 S.
Since the reports on tax planning structures with insubstantial letterbox companies in tax havens, e.g. through the so-called Panama Papers or Paradise Papers, the topic of "substance" has become widely known and also to a broad public. The OECD and the EU address it within the current initiatives against base erosion and profit shifting (in short: BEPS). Taxation on the basis of economic substance is becoming a central objective of the coordinated avoidance of tax avoidance in international tax law. 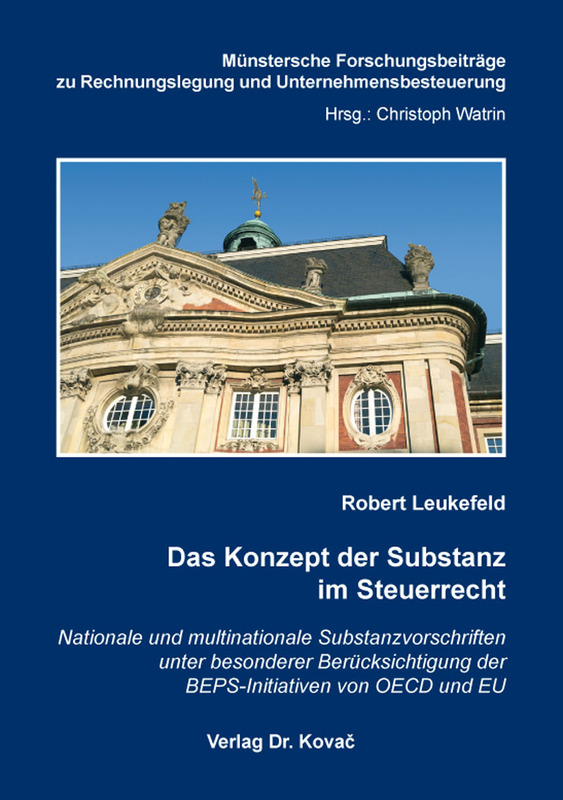 However, since neither the OECD nor the EU define what is meant by substance in tax law, the present work addresses this issue in the context of national (German) and multinational tax law. In national tax law, the substance of a company serves as a starting point for (un)limited tax liability, which is linked to the physical presence and/or the personnel and/or the functions exercised by the company. However, the primary purpose of the substance concept is to prevent abuse in inbound and outbound structures by linking legal consequences, e.g. certain exceptions to taxation or tax refunds, to the physical, personnel and/or functional substance of a foreign company. The work deals in detail with the EU’s requirements for anti-abuse rules and the effects of the BEPS initiatives. The relevant national anti-abuse rules, which are in fact linked to the substance of a foreign company, are examined and the resulting substance requirements are compared. The so-called substance rules include in particular � 8 (2) AStG and � 50d (3) EStG. Questions of interpretation and possible infringements of EU law are analyzed and discussed in detail. The author also makes a proposal on how substance could be anchored uniformly in German tax law.